Celebrate the most wonderful time of the year with Alma de Cuba and bring a touch of Latin American to your festivities in 2018. Whether you’re looking for a fabulous festive lunch this yuletide, or a showstopping Christmas Day dinner, there’s nowhere better to host your celebrations than Alma. Wine and dine in one of the city’s most elegant bars and restaurants for a Christmas filled with fun, festivities and cheer. Located in the heart of Liverpool, Alma offers an enchanting atmosphere to celebrate the season of joy. Once St. Peter’s Catholic Church, the restaurant is within a magnificent listed building that boasts breath-taking original features. With glittering stained-glass windows and a grand old alter, it’s the perfect venue for the ultimate festive treat. 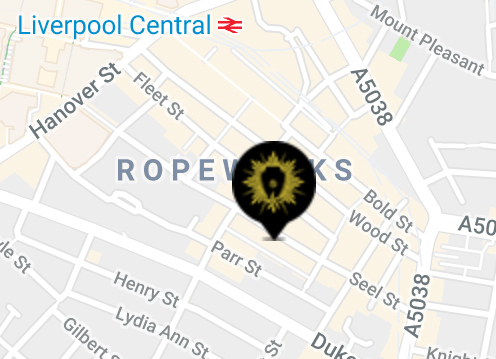 Adorned with twinkling chandeliers and cosy candles, celebrate a magical Christmas with your loved ones at Liverpool’s favourite bar and restaurant. Bring family, friends and work colleagues together this December, with our Daytime Festive Lunches. Served Monday-Thursday between 12pm and 10pm, they’re the perfect opportunity to catch up with loved ones before the big day. Inspired by the diverse dishes of Latin America, our menu offers delectable choices like nothing else you’ll find in Liverpool. Start your meal with a warming roast parsnip and cauliflower soup, nibble smoky aubergine and wild mushroom croquettes or tuck into a chicken romesco topped with toasted almonds and pimento. For main course, pick from a classic roast turkey with all the trimmings, a prime rump beef fillet served with Yorkshire pudding and seasonal vegetables or our more contemporary options of luxurious salmon with herb-crushed potatoes, and risotto-style pumpkin orzo with a goat’s cheese crumb, thyme-roasted pumpkin wedges and pumpkin purée. And it wouldn’t be Christmas without copious helpings of pudding – our daytime menu includes a traditional Christmas pudding with brandy cream and red currents, a spiced orange and polenta cake with citrus cream and dried cranberries or a passion fruit posset with caraway seed shortbread. 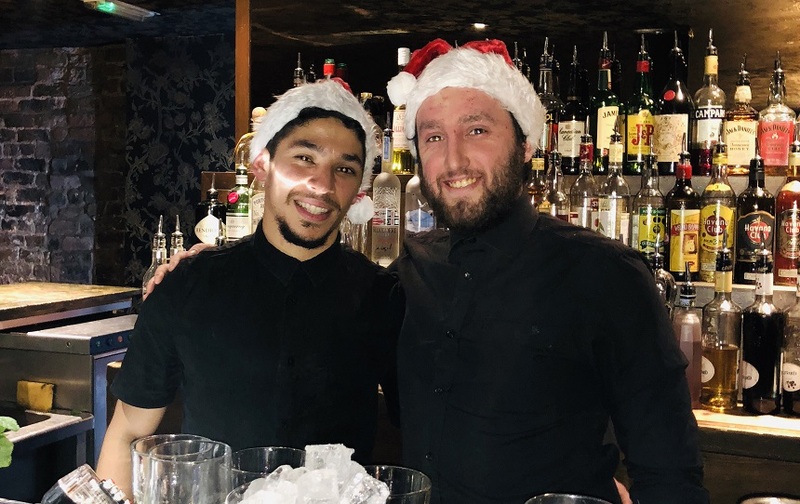 For just £19.95 for two courses, or £24.95 for three (children half price), you can enjoy an early Christmas celebration with your nearest and dearest. Gather your loved ones for a festive celebration on Fridays and Saturdays throughout the festive period with a fabulously fiesta-inspired three-course menu at Alma de Cuba. For just £35.95 per person (children half price), tuck into a decadent menu of locally-sourced dishes, blending the food of fiestas with traditional British festive favourites. Enjoy a choice of four starters including steamed mussels in a Caribbean inspired curry, smoked aubergine and wild mushroom croquettes, chicken romesco, or roast parsnip and cauliflower soup. And then tuck into hearty mains, from traditional turkey with all the trimmings and a succulent prime rump beef fillet, served pink with a Yorkshire pudding and seasonal vegetables to a salmon with a crispy skin and herb-crusted potatoes or sweet honey and mustard glazed gammon served with creamed cabbage and seasonal vegetables. Or, for vegetarians, enjoy pumpkin three ways with a goats’ cheese crumb. And for everyone’s favourite festive course, pick from boozy traditional Christmas pudding, rich and luxurious chocolate fondant, a spiced orange and polenta cake or refreshing passion fruit posset with caraway seed shortbread. Relax and unwind this festive season with a Christmas Day dinner at Alma de Cuba. Enjoy precious time with your loved ones, without the stress of hosting, and enjoy a sunshine-filled feast in the festive atmosphere of the old church. Our Christmas Day Menu includes sumptuous starters of roasted parsnip soup with chilli, pumpkin and honey brittle, a lobster roulade with squid ink and coriander puree wrapped in smoked salmon and a golden beetroot and feta cheese tart with a beetroot and caper tapenade. Enjoy a traditional Cheshire turkey wrapped in Parma Ham with all the trimmings for main, or pick from a roast prime rump fillet with thyme-flavoured Yorkshire pudding and all the trimmings, a wild seabass with herb potato cake and Greenland prawn and dill consommé or a delicate wild garlic and goats’ cheese wellington with glazed baby vegetables and tarragon velouté. For dessert, take your pick from three festive choices, including a traditional Christmas pudding with brandy and nutmeg cream and redcurrants, an extravagant croquembouche for one with profiteroles filled with chocolate cream and candied orange or a winter berry crème brûlée, topped with a vanilla crust and homemade ginger bread. Finish with a selection of Cheshire cheese, crackers and chutneys, served with port. 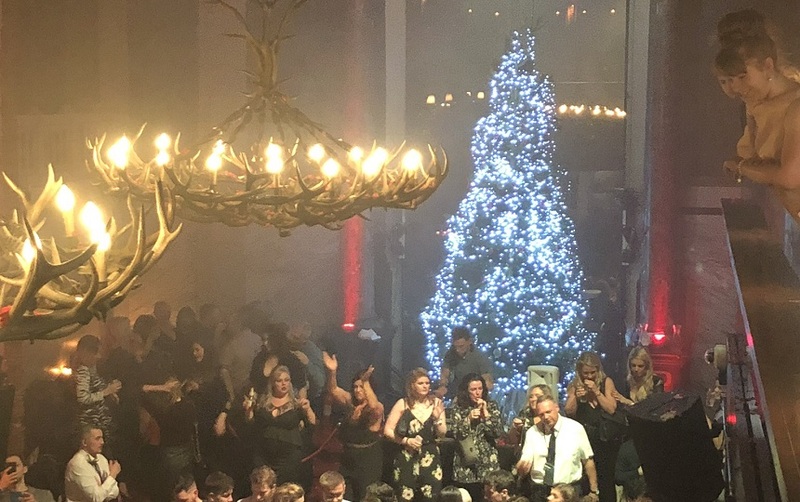 For £95.00 per person (children half price), take the stress out of Christmas with a festive meal in one of Liverpool’s most luxurious bars and restaurants. 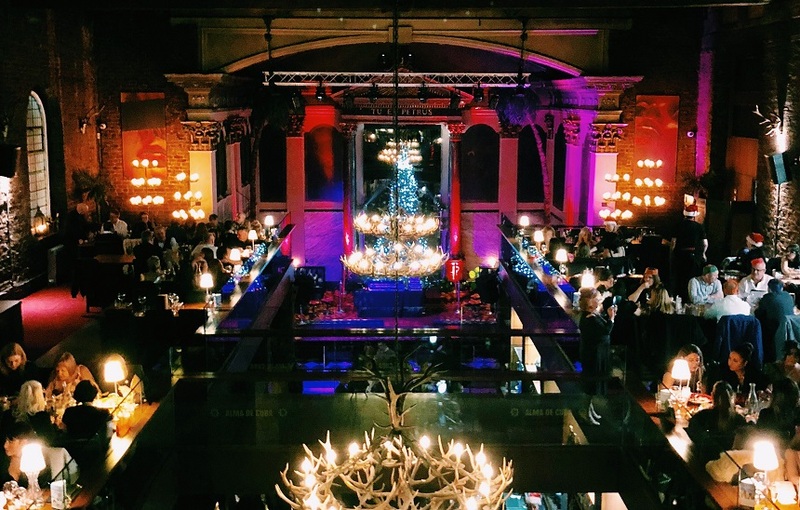 We can’t wait to welcome you into our stunning venue for all your festive celebrations. Alongside our delicious menus, why not enjoy a delectable Cuban cocktail or two and some fabulous fizz to celebrate the most wonderful time of the year? 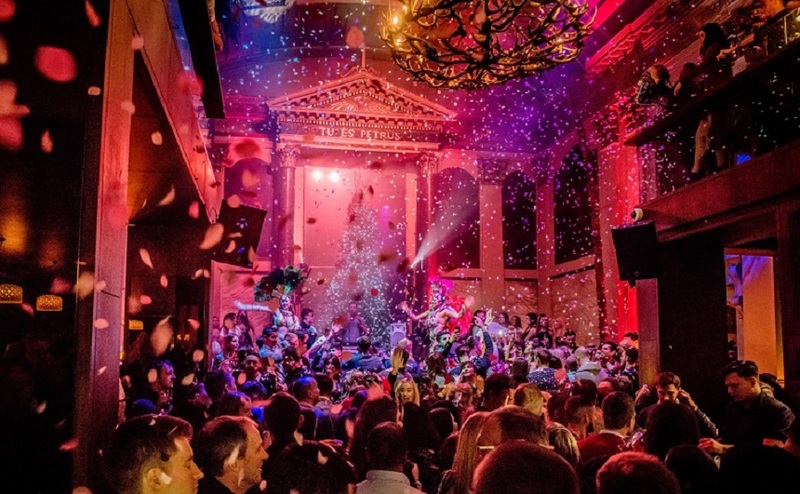 With its enchanting atmosphere, spectacular Christmas menu and dazzling samba dancers to keep you entertained throughout your festivities, there’s no better place to enjoy a Liverpool Christmas than Alma de Cuba. For a Christmas to remember in 2018, please contact our reservations team on 0151 236 0166 or visit our contact page here.